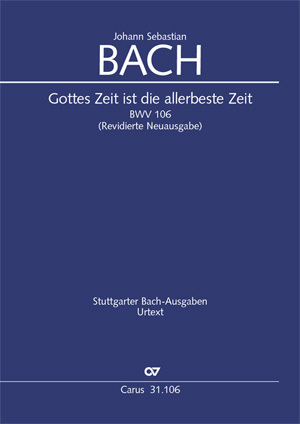 The Actus tragicus or Gottes Zeit ist die allerbeste Zeit BWV 106 remains one of Bach’s best-known and most admired works, one which continues to resonate to this day – a "work of genius such as even great masters seldom achieve" (Alfred Dürr). The cantata is one of the earliest known vocal works by Johann Sebastian Bach. 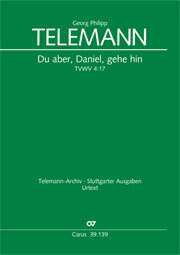 It was written during his time at Mühlhausen, probably in 1707, when Bach took up the position of organist at the Divi Blasii Church. A possible occasion for its composition may have been the funeral of the mayor of Mühlhausen, Adolph Strecker. The short, slow "Sonatina" with two recorders, two gambas and continuo gets the listener into the mood of the character of the cantata. This instrumental combination is unique in Bach’s vocal output, but could derive from a central German tradition. This new edition is a critical-practical edition which combines both the latest discoveries in Bach research with a detailed Critical Report as well as addressing current questions on performance practice.